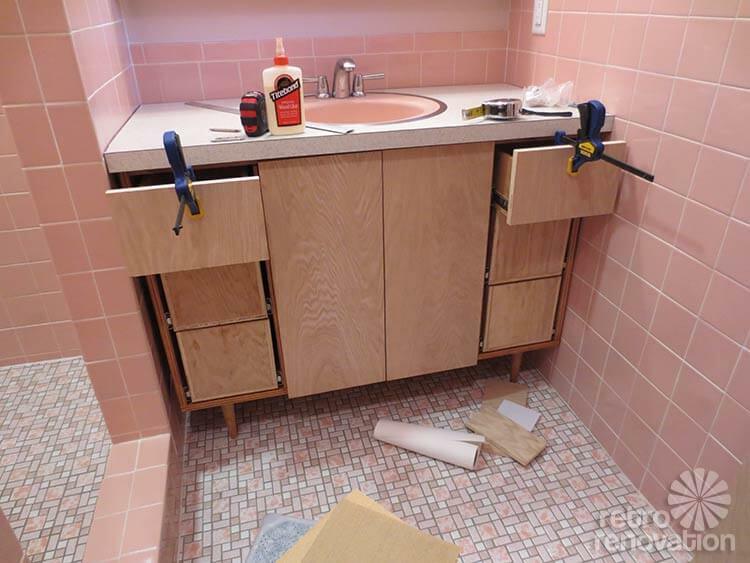 Planning on remodeling, repairing or building your own vintage or midcentury style bathroom? Then you’ll likely need at least one sink for your space. While we love the rainbow of colors and many shapes and sizes of vintage sinks, sometimes finding the right one for your bathroom can be a challenge. To help make sink selection easier for you, we’ve compiled a list of our five favorite sink styles — each with specific sink models you can order new today — that would work wonderfully in vintage and midcentury style bathrooms. 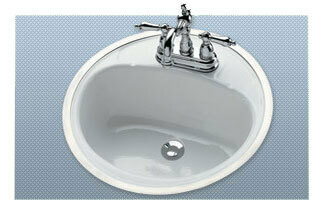 The Kohler Tahoe is our #1 choice for a midcentury-style, hudee-ring bathroom sink. 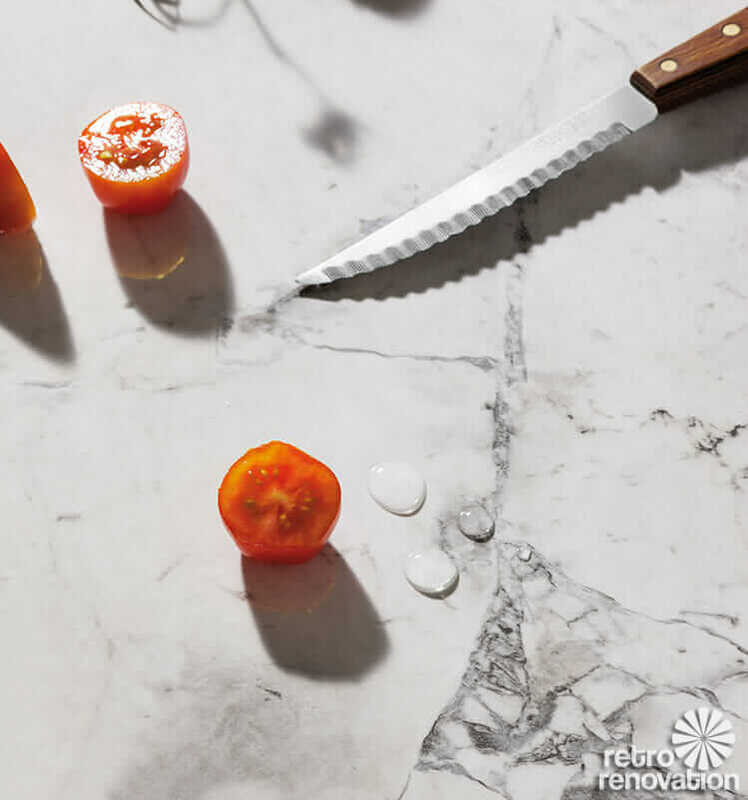 We love that it is cast iron like the vintage originals. This guy has likely been in continuous production for … 50 or 60 years. We need to ask Kohler! 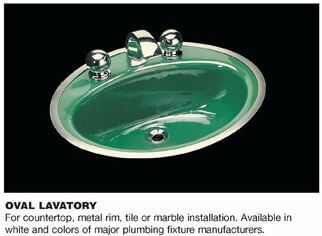 Ceco Sinks also offers porcelain-enamel-on-cast iron sinks with hudee rings — in both oval and rectangular shapes. To get the hudee ring, you need to go with the 8″ spread. The sinks used to be available in 50 different colors, but as of today only six colors are offered: White, Biscuit, almond, bone, black and platinum. 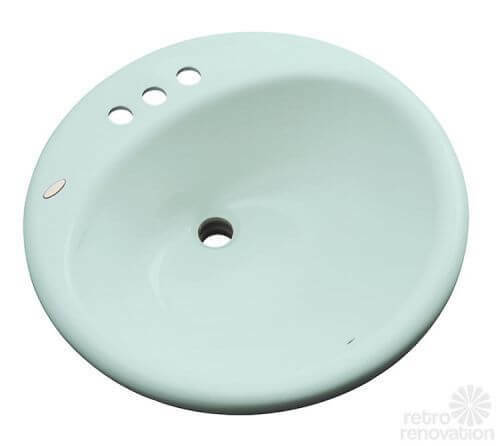 Bootz Industries offers two porcelain-finish-on-steel hudee ring bathroom sinks in round and oval that also are a great choice for midcentury bathrooms. Kate used one in her mint green bathroom refresh. These sinks are less expensive than their cast iron cousins. 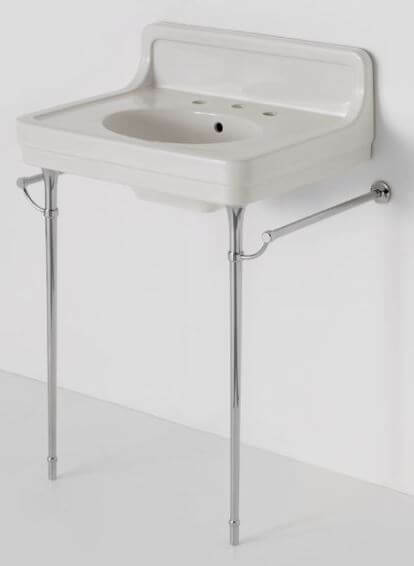 Wall-hung sinks on chrome legs, with or without integral towel bars, were ubiquitous in midcentury bathrooms. To get this look “new” today. 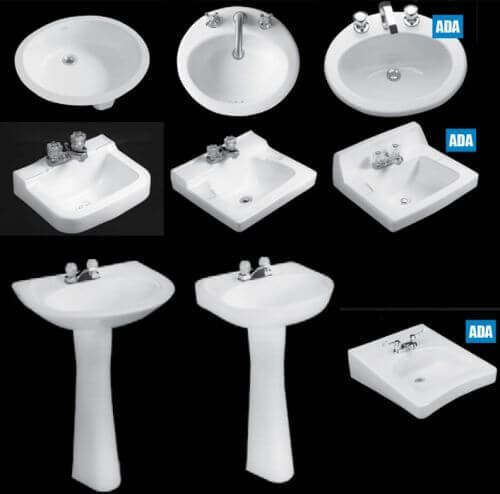 Pam is pritty darned sure that you can install one of these commercial wall-mount sinks designs from American Standard, Kohler, and a few other companies (affiliate link) as intended — that is, on a wall, using the brackets provided… then, add chrome legs. (We’re banking on the hope that there are holes on the bottom side of these sinks where you can screw the legs in. 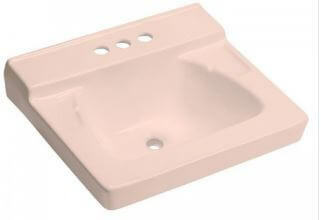 Peerless Pottery also has sinks like this — including in pastel colors!!!. 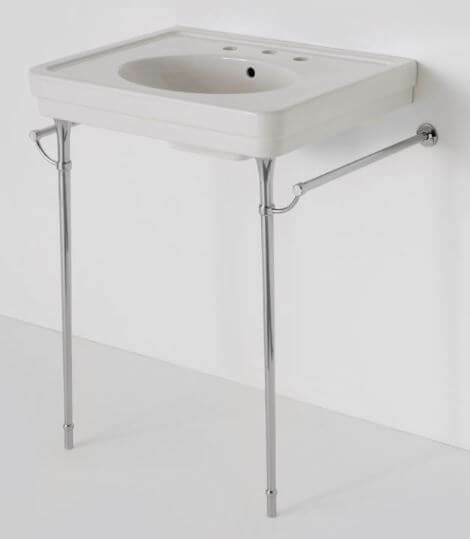 Where to find chrome or other metal legs for wall-hung sinks: Check deabath.com for their variety of metal lavatory legs, priced beginning at $55/pair. You might also find legs vintage… at your local hardware store… or even find sink legs on Amazon (affiliate link). Altogether, it looks like you put together a combo like this — wall-mount sink + legs — for as little as $100, not including labor. 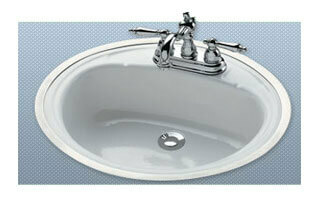 Or, you could save even more money if you found a sink vintage — Pam’s ReStore is usually chock-a-block with such sinks. If you want to go more upscale, the Alden Sink from Waterworks, available in two styles, is a favorite because of its metal legs with integral towel bars — spendy but pretty and very appropriate for a vintage or midcentury style bathroom. There’s a matching toilet, too. If you want to dial back the clock a bit, you could choose this “Belle Epoque” sink from Renovator’s Supply (affiliate link), also adding legs — although with a fluttery design like this, we’d go with “fancy” legs, rather than simple ones. We’re thinking… very early 20th century for this look. But what a practical sink — what with all the space for stuff. Another possibility for this look: Get one of these sinks on porcelain legs from Strom Plumbing/Sign of the Crab, then ditch the porcelain legs for metal legs. However: I am making a guess that this is possible — talk to the company first to make sure it would work including that the metal legs would support the sink safely. Several of these sinks have a simpler basin design — better for a midcentury home than sinks with lots of decorative flourish. Strom Plumbing/Sign of the Crab also makes the Mississippi bathroom faucets that Pam used in her bathrooms (affiliate link) — and which she continues to adore. 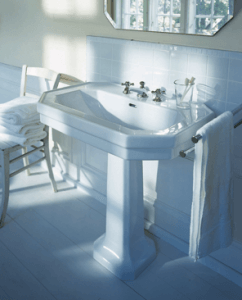 And if you want to go a little more retro-modern, Duravit is a favorite go-to. 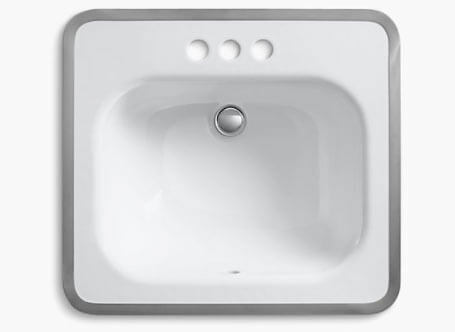 Above, the already-a-classic Duravit Happy D sink. This one is about as far as we’d go into the Duravit line though — other sinks, while nice, read too contemporary for our taste. Peerless Pottery is currently the only place we know of where you can get porcelain sinks in retro colors such as: Venetian Pink, Dresden Blue and Harvest Gold. See this story updating where to find them. 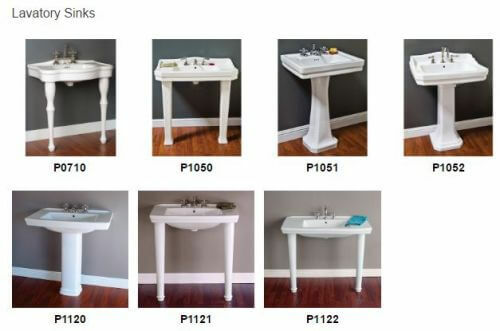 If you want color and are willing to “settle” for a drop-in sink, Thermocast currently offers 17 styles of acrylic bathroom sinks in 29 colors including pinks and aquas. 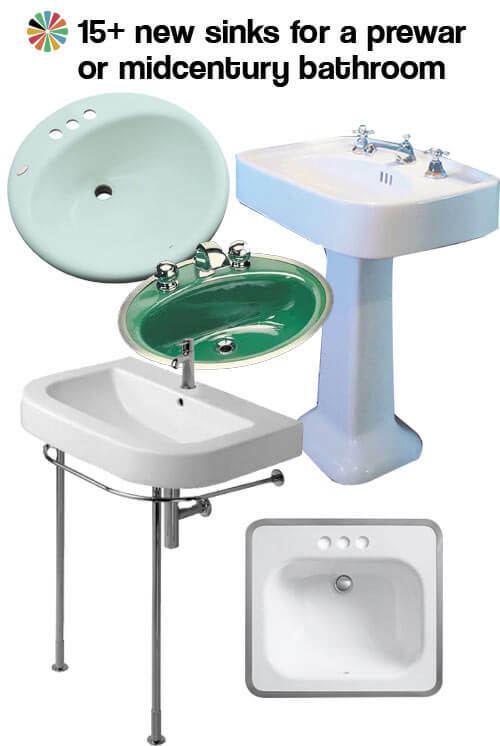 If you have a pre-war bathroom, a pedestal sink may be more historically accurate. 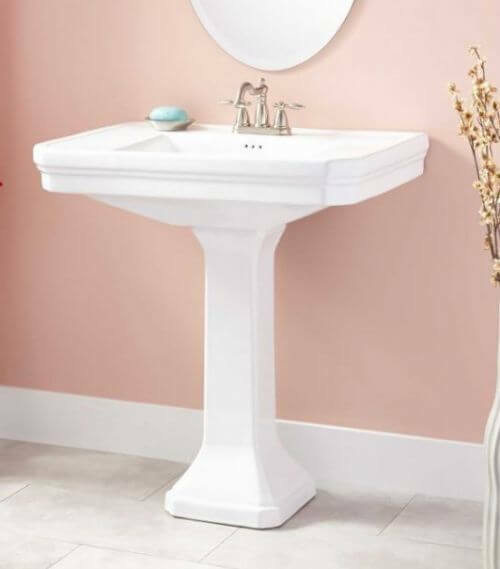 We’ve written about the Duravit 1930s collection before, and their pedestal sink is one of our favorites for a vintage bathroom because of its octagonal shape and complete series of sinks and toilets for a matchy-matchy bathroom. 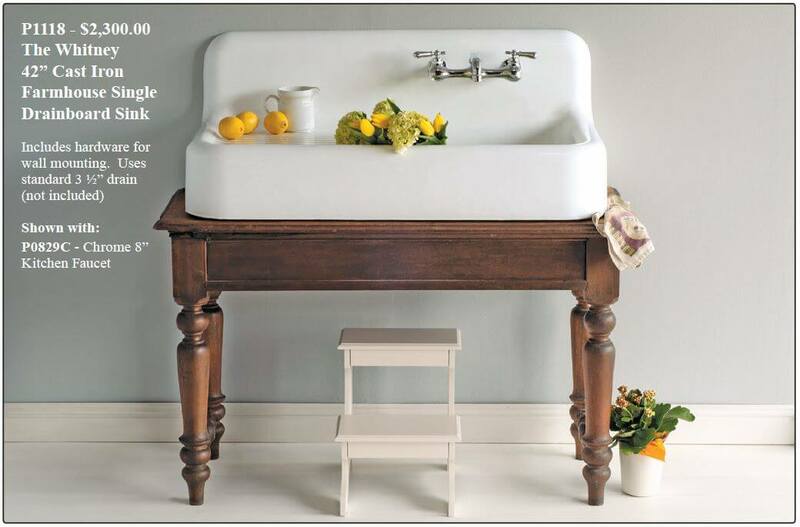 We love this Liberty reproduction sink by St. Thomas Creations for a pre-war bathroom — it’s the classic for the period. 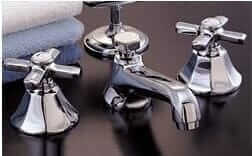 You can also get this from deabath.com. Parenthetically, because we wanted to show you how this sink looked in place: Jane found this St. Thomas-like sink for her mother’s newly created bathroomnew at Signature Hardware — but it’s no longer shown as available. This Kacy pedestal from Signature Hardware has a bit more going one, but it has the deco look, too. P.S. We want to know the paint color — gorgeous! And for a few more sinks in this vein, look at St. Thomas Creations … and Toto’s Promenade is nice looking, too. Still want to see more bathroom sinks? Visit our archive of sinks and vanities — new and vintage. 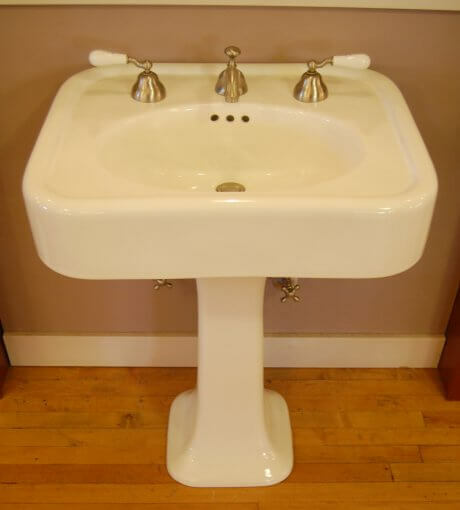 And don’t forget to call old family-run plumbing supply places to inquire about new old stock sinks they may have sitting in their back rooms or warehouses. 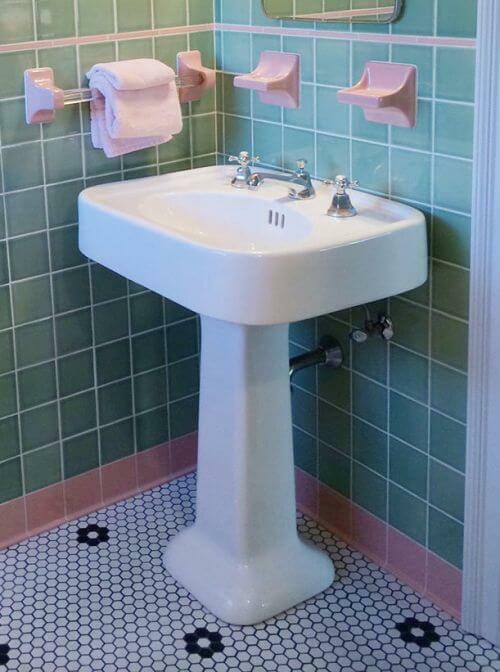 I love my pink (1980s) and green (1970s) NOS porcelain sinks in my two bathrooms. After several years, I still enjoy cleaning them and seeing how they shine! 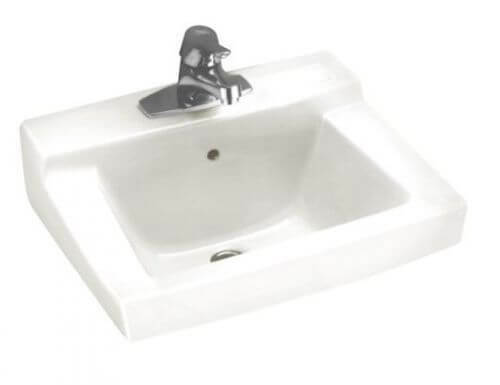 Do you have an opinion on American Standard’s Retrospect console sink? I have a 1950 gray tile with darker gray trim tile in the original bathroom. Unfortunately the toilet and sink were replaced with a horrible modern pedestal sink and toilet. I am trying to find affordable replacements for them. I know it is not exactly period, but the Retrospect has metal legs and is affordable.I thought it was a better choice than a pedestal or a modern vanity. 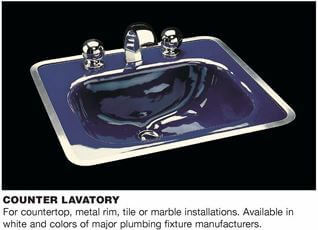 Also Kohler Memoirs collection has a console sink with metal legs but it feels a tad modern. Which do you think is better? or none of them? I know this post is old, but I’m hoping others comb through everything on retrorenovation.com as much as I do and might can help. I found two matching Eljer sinks with a 4″ front apron and holes for legs for $5 each at my local Restore – and of course, bought them. 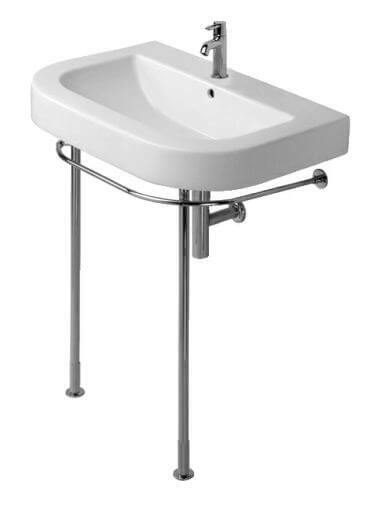 I’ve found legs on ebay for one – still looking for a vintage set with towel bars for the other (after deciding that the gorgeous ones through deabath.com were out of my price range) for our mid/mod retrovation. Does anyone have any leads on a set with towel bars or know of a way to add them to a vintage set? TIA! Hi Suzanne, the only way I know of is — find them vintage. I saw some on ebay recently…. I don’t know of anyone making these new, but that said, I have not done recent research.